Quibble Island Cemetery is one among huge and historical Christian Cemeteries in Quibble Island, Greenways Rd, MRC Nagar, Raja Annamalai Puram, Chennai, Tamil Nadu, India. This Christian burial ground was formed in 1903 and is located in a 6.5 hectares site. With an act of ecumenism (promoting unity among Christians), the cemetery is being shared by both Roman Catholics and Protestants of all denominations. The cemetery has a small number of old tombstones, dating back to the latter half of the 1800’s and also bears tombstones of Comedian actor Chandrababu and political speaker Valampuri John. The cemetery is maintained by the Madras Cemetries Board and the Kilpauk General Cemetery and the Kasimode Cemetry also comes under this board. Since the cemetery has reached its capacity, the board is contemplating to introduce Multi-tier Vaults for future burials. The tributaries of Adyar river forms a bend at the mouth of the estuary and this is called as Adyar Creek. The vast Adyar Estuary lies between the edges of the sandbank of the sea and Adyar bridge and includes few small islands. 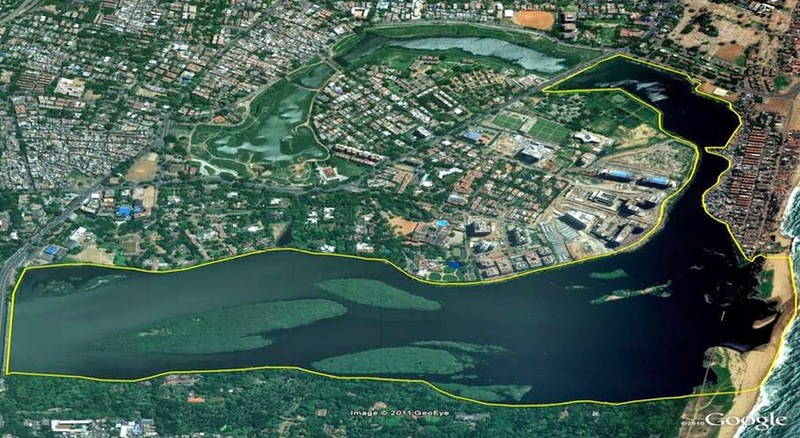 Adyar Creek turns to north towards mainland near Chettinadu palace and forms an U - turn adjacent to Foreshore Estate bridge and terminate nearer to Mandaveli. The island peninsula is sorrounded by the Adyar Creek was named as Quibble Island and the original Adyar Creek comprised about one hundred acres. Meaning of Quibble: minor criticism, trivial objection, trivial complaint, adverse comment.